24,000 pieces have been made. In short: A bargain for such a beautiful, natural eau de cologne without a grandma note! 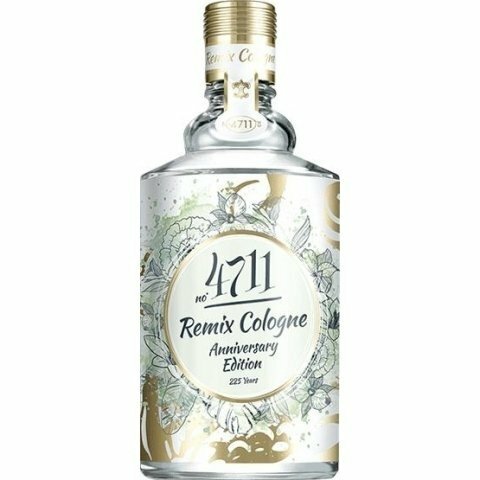 I was just in the city and wanted to equip myself with all kinds of cleaning agents and bathing things at Müller when, due to toilet stone and chlorine smells of the household department, it occurred to me that FabianO had rated the Remix Cologne of 4711 so well and not as a better window cleaner. The normal 4711 is known and for me no longer a benchmark for a contemporary EdC, although it is definitely better than its reputation! Only with us in Germany 4711 has this grandma image. I had no expectations to find this limited edition of 2017 yet, since the 2018 (smells like Orange Sanguine) is already out and apparently soon the 2019 version will follow. But lo and behold: not only were there just three 100 ml vials left on the shelf, they were also reduced. From 19.95 to 7.95! Of course I took them all... Summer will hopefully come soon. The fragrance is unmistakably 4711, but much more contemporary! A very positive surprise! The granny neroli note is very reduced, the start citritsch fresh (natural aromas of lime, lemon and bergamot). A little orange and rosemary follow from the middle part. The petitgrain, a bit of lavender/floral notes remain for a good four hours after the fresh start and ensure a feeling of well-being and spring. The durability is more than decent for an Eau de Cologne! Here the perfumers from the Glockengasse have succeeded a real hit! Too bad that this elegant "kölsche" water was not applied by default! But well, my 300 ml will probably hold up a bit... If you catch this EdC anywhere else: strike blind! I can recommend this with a clear conscience and I generally do not buy a fragrance without having tested it. What Tom Ford launches so all about Amalfi/Portofino/coastal or Whatever fragrances in different blue flacons is a joke, you put this EdC next to it! It is natural, classic, fresh, discreet and does the Eau de Cologne category credit. Acqua, the Parmas Ur-Colonia and all the Fords don't come with them. In terms of price this 4711 is a real "Aqua mirabilis", a miracle water! Unconditional recommendation to buy! One of the best 4711's to come out in recent years, light and soft like baby cologne. This remix edition replaces the few rough and slightly outdated edges from the original blend with a well-balanced mix of citrus (lemon, orange, bergamot) and aromatic notes (lavender, rosemary, petitgrain). A gentle, fresh, very easy to wear fragrance for the warmer months.